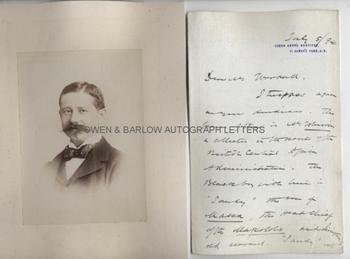 HENRY HAMILTON JOHNSTON AUTOGRAPH LETTER Signed. SIR HENRY "HARRY" HAMILTON JOHNSTON (1858-1927). English African explorer, botonist and colonial administrator. One of the key players in "The Scramble for Africa". ALS. 3pp. Queen Anne's Mansions, St. James's Park, S.W. July 5th 1894. To William Woodall. Together with a fine contemporary photograph. "I trespass again on your kindness. The bearer of this is Mr. Whicker, a collector in the service of the British Central Africa Administration. The black boy with him is 'Sandy', the son of Masea [or Masca?] the Head Chief of the Makalolo and Livingstone's old servant. Sandy will some day succeed his father as Chief. 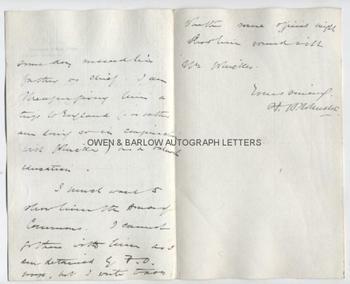 I am therefore giving him a trip to England (or rather am doing so in conjunction with Whicker) as a valuable education. I much want to show him the House of Commons. I cannot go there with him as I am detained by F.O. work, but I write to ask whether some official might show him round with Mr. Whicker." 8vo (approx 8 x 5 inches). The mounted photograph measures approx 5.75 x 4 inches (excluding card mount and is a fine 19th century albumen silver print, showing Sir Harry gazing fixedly at the camera and with a dashing waxed moustache. Mounting traces on versos, else fine. Sir Henry Hamilton Johnston was one of the most important figures in Victorian colonial history. He met with Henry Morton Stanley in the Congo in 1883 and was one of the first Europeans to see the river above the Stanley Pool. In the course of his explorations, he conducted several treaties with native chiefs and eventually these were absorbed into the British East Africa Company and other companies. He was a key player in what became known as the Scramble for Africa and the 'Cape to Cairo' policy and in 1891 became the first Commissioner of the British Central Africa Protectorate.